Starting in the mid-nineties, ecologically-minded Americans increasingly came to see farmers markets as a way to bring healthy foods to poor neighborhoods, support local organic agriculture, and even address global warming. During the Bush years, major health philanthropies joined these efforts, making new grocery stores their highest priority in combating obesity, which was disproportionately affecting the poor. Food justice advocates were thus taken aback last April when new public health research revealed that there were more grocery stores and supermarkets in poor communities than in middle- and upper-income ones. More importantly, the studies found no relationship whatsoever between childhood obesity and neighborhood food availability. In effect, children who have more access to grocery stores and supermarkets are no more likely to become obese than children who have less. The findings — independently arrived at by two large national studies published by RAND and Social Science and Medicine — landed on the front page of the New York Times. The reaction from some advocates was swift and harsh. "I'd love to take a couple of those researchers and drop them in several neighborhoods where I grew up," First Lady Michelle Obama told NPR. "Go get a head of lettuce — one that's affordable, that's fresh — and see what happens." Mrs. Obama went on to suggest that poor mothers on the south side of Chicago have to travel five miles to reach a grocery store. But Mrs. Obama need only visit the US Department of Agriculture's online Food Desert Locator to discover that the vast majority of Chicago's poor live well within walking distance of grocery stores. Just 0.4 percent of Cook County's 5 million residents are low-income and live more than a mile away from a grocery store or supermarket. In Mrs. Obama's old neighborhood, fewer than 7,000 poor people have to travel more than a mile. It is no exaggeration to say that most Americans, and especially the poorest among us, have greater access to healthy food than ever before. Why, then, the rush to attribute our growing waistlines to a supposed lack of fruits, vegetables, and other whole foods? In a major new essay for Breakthrough Journal, sociologist Helen Lee, who authored the Social Science and Medicine study challenging the neighborhood-obesity connection, explains how journalists, public health officials, and food justice advocates got the obesity epidemic so wrong. She begins in the late 1990s, when activist journalists and public health officials were less focused on food deserts than with how we had become a "fast food nation." The decision to blame food corporations for our burgeoning waistlines came in part from a misunderstanding of the successes of the tobacco-control movement. Some public health scholars believed that framing smoking as a consequence of corporate power had created a "public opinion environment conducive to public policy solutions that burden powerful groups." Convinced that reducing obesity rates would require a similar effort, scholar-activists advocated targeting food corporations as the source of the obesity epidemic. The problem was that the major declines in smoking came not from the high-profile anti-Joe Camel campaigns of late nineties but rather from decades-long public education efforts about the harms of smoking. Moreover, the relationship between fast food and obesity has always been conjectural. Consider that between 1952 and 1980 the number of McDonald's franchises skyrocketed from 1 to 8,000, and yet obesity rates remained virtually flat. The rise in obesity rates starting in the nineties and its plateau in the mid-aughts remain as mysterious to public health researchers as the decline in violent crime is to criminologists. Moreover, where smoking can result in largely untreatable diseases like lung cancer, obesity is one risk factor among many for diseases that are, in fact, highly treatable. While national health philanthropies were pouring hundreds of millions into farmers markets and grocery stores, better medical care was reducing mortality rates for diabetic adults by an astonishing 25 percent and cardiovascular disease by 40 percent. Part of what makes obesity a wicked problem is how existing solutions — farmers markets, anti-corporate marketing — led advocates to frame the problem in particular ways. "The picture painted by advocates of grocery stores and gardens in the inner city was compelling to so many in no small part because it combined an established way of thinking about poor neighborhoods as materially deprived along with rising cultural support from middle-class Americans for eating healthier, locally grown foods," Lee writes. The new research has not exactly inspired food justice advocates to rethink their approach. "Obesity is declining in Philadelphia because of a network of people dedicated to helping vulnerable children and families," asserted the head of the Kellogg Foundation recently. And yet another journalist, Pulitzer-winning New York Times reporter Michael Moss, is out with a book (subtitle: How the Food Giants Hooked Us) reducing the obesity epidemic to food companies. To be sure, food corporations have played a role in making the obesity epidemic. They must exercise greater responsibility. 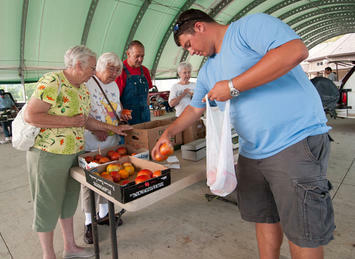 And farmers markets can be a way to both deliver fresh produce and build community. Confronting the negative impacts of obesity on low-income Americans means confronting difficult social problems like inter-generational poverty, inadequate access to health care, under-performing schools, and myriad barriers to higher education. It requires a perseverance over decades, and a commitment to getting the science right. Easier to build more farmers markets. Shellenberger and Nordhaus are co-founders of the Breakthrough Institute, a leading environmental think tank in the United States. They are authors of Break Through: From the Death of Environmentalism to the Politics of Possibility. This piece originally appeared at TheBreakthrough.org. Submitted by Suzaine on Wed, 05/20/2015 - 06:30. Submitted by mobi on Wed, 05/20/2015 - 03:16. Submitted by VickiHuter on Wed, 05/13/2015 - 03:37. Submitted by david watson on Mon, 05/11/2015 - 05:48. Submitted by david watson on Fri, 05/08/2015 - 15:15. Submitted by tom_8552 on Mon, 04/27/2015 - 06:12. Submitted by david watson on Wed, 04/22/2015 - 14:28. Submitted by johnz308 on Fri, 04/10/2015 - 09:47. Submitted by quangstar on Tue, 08/12/2014 - 03:35. Submitted by passionlab on Tue, 12/10/2013 - 08:54.